Try out the BetterMood app and make yourself happier! BetterMood is a tool that can help you to create greater happiness and harmony in your life. Frequently playing the app game may assist you in releasing negative thoughts, overcoming bad moods or addressing anxiety. Select positive images and inspiring sounds to boost your mood. Transform your inner world by swapping negative mental pictures for positive ones! Identify your mood daily and receive inspiring, motivational tips for improving your state of mind! Take interesting, fun-filled challenges to improve your physical, emotional and mental well-being. Select inspiring challenges, have fun and share your experience with friends. Positive ratings from friends instantly earn you great rewards. Create a personalized magic planet where you are free to plant and harvest magic fruits and flowers, concoct magic potions and unlock inspiring EnergyMeditations and GoodMood-Trip video clips. Or ask the magic owl Fortunella for your very own motivational FortunellaScope. You receive real rewards in the form of highly motivating, short GoodMood-Trip video clips and EnergyMeditations. In addition to these, you will receive tips for improving your lifestyle/rhythm. Devote approximately ten minutes a day to BetterMood and EnergyMeditations and improve your mood. Unlock the power of positive thought through play. Have fun on your very own magic HappyPlanet! Grow magic trees and flowers, unlock EnergyMeditations or receive a FortunellaScope, complete with motivating tips for brightening up your day. Challenge yourself with exercises that support your well-being or enjoy a mood improvement with MoodFixer. Make sure you share your success and progress with friends so you can earn rewards! Our entertaining app game is primarily designed to elicit positive feelings and to boost your happiness levels. Play, relax and meditate. Experience first-hand the positive impact of activities developed by experienced gamers and seasoned meditators. 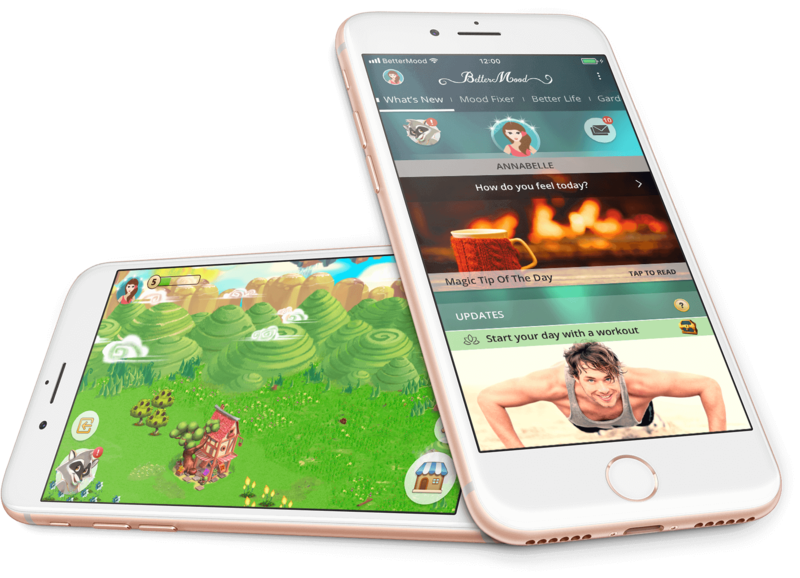 BetterMood App Game is a thoughtfully designed application that takes you on a magic ride to the land of happiness and good spirits.